As a calm, focused and motivated Brock Lesnar conversed with UFC, SportsCenter and various news outlets about his highly-anticipated return to the Octagon, a lingering doubt remains in the minds of the fans and even Vince McMahon - the man who has invested three years into the building Lesnar as WWE's insuppressible monster - as a crushing defeat to Mark Hunt could diminish a large amount of his character's credibility. "It's a tough challenge for me. Mark Hunt is a heavy-hitting, hard-headed human being," said the assured Lesnar who, while evidently understands the risks his opponent, is cool, calm and collected and understands what is required to emerge victorious in the main event of UFC 200. But make no bones about it, Mark Hunt is a ruthless knockout artist who has demolished some of the finest heavyweights in recent years and went mightily close to obtaining the prestigious UFC title. He is rightfully the betting favourite. While odds do only reflect the balance of probability, Vince McMahon could and should have a cause for concern. His biggest pay-per-view draw, his personal money machine and biggest investment is facing one of the toughest fights of his mixed-martial arts career, which could end catastrophically and he is virtually helpless to change it. A crossover superstar that personifies legitimacy, Lesnar's limited but valuable appearances helped skyrocket WWE's entire ratings. Due to that, substantial faith has been devoted to him highlighted by the stunning ending to The Undertaker's legendary 21-year long streak and the savage decapitation of John Cena to win the company's top-tier championship, culminating in a truly dominant stint in which he hasn't been lost clean in over three years. In that time, credible stars have been sacrificed in order to solidify Lesnar's status as the man to beat. When he is eventually beaten, it's destined to change his successor's career forever. WWE have built up a fearsome reputation for 'The Beast' and, before Lesnar's ambitions suddenly diverted back to his mixed-martial arts career, the clearly constructed plan was to elevate an upcoming talent when his contract runs out and he calls it quits. All of a sudden, the landscape of his future in the WWE is firmly up in the air. For his credibility - in the possibility that he loses - the mainstream audience, including the younger generation, could begin to question why the company's biggest stars can't get the job done but Mark Hunt can. Of course, the WWE is scripted and the UFC is absolutely for real, but seeing a bloodied, battered and beat up Brock Lesnar doesn't do his credibility as the most-feared superstar on the roster any favours at all. Subsequently, the aura of dominance he possesses is in danger of being severely diminished. As the baddest man on the WWE roster by a stretch, only Paul Heyman could conceal a potential defeat and sell Lesnar as what he is today, but despite Heyman's magic on the microphone, that is a difficult proposition. Vince McMahon, despite booking Lesnar to lose once in each 2012 and 2013, gradually built him up as an insuppressible monster but with his career coming to a close in the next year or two, time would be against them in hoping to rebuild his reputation in the company. With the new breed of talent barging through the curtain of the main roster, a whole new direction could be taken if Lesnar loses. His SummerSlam opponent Randy Orton, while extremely unlikely, being given the nod to beat the unbeatable wouldn't be the most shocking scenario we've ever seen. After all, Lesnar's desire to defeat Mark Hunt and his demons of diverticulitis inside the Octagon has once again trumped any inviting paychecks the WWE can offer to lure him away from that burning desire and this may well be the time Vince McMahon makes a change. Through no fault of Lesnar, he clearly favours the UFC, but McMahon's consistent loyalty and investment hasn't been fully rewarded. While the negatives stand out by a country mile, and WWE seem to be tolerating Lesnar's UFC return at best, a victory for the 38-year old will propel him to heights never seen before. Crossover athletes as talented and genetically gifted as Lesnar are an extremely rare breed; bashing up Mark Hunt's face - a credible, dangerous heavyweight - can further boost his stock and enable the WWE can cash in with another dominant run continuing with the decimation of Randy Orton in their colossal SummerSlam bout. Paul Heyman's script wouldn't be short of boasting adjectives either. He sells Lesnar as an on-screen beast good enough, and keeping an element of realness to the WWE's competition, imagine how his persuasive voice would swank Lesnar's potential victory over Mark Hunt. Should Lesnar win at UFC 200, his credibility as one of the baddest men not just in the wrestling industry but in the entire world, would absolutely plummet and result in an even bigger elevation for the superstar who is lined up to potentially end his in-ring career at WrestleMania. This, of course, is in the presumption that Lesnar remains with the WWE and decides not to begin a second long-term stint of fighting in the Octagon, which also isn't a given at this point. His love, passion and focus is firmly with mixed-martial arts right now. A stunning victory could boost his stock as a crossover superstar like never before, but defeat can also leave his WWE credibility in tatters. 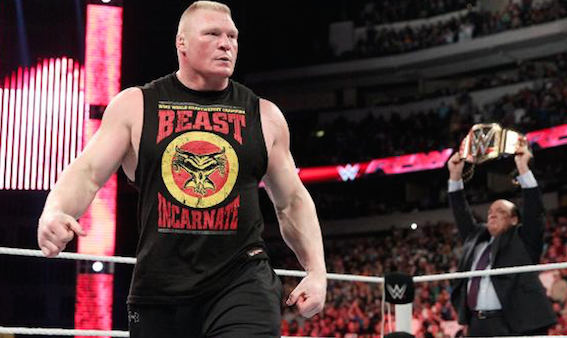 What does either victory or defeat mean for Brock Lesnar's credibility in WWE?